Thomas Countryman is the chair of the Arms Control Association board of directors, a position he has held since October 2017. Mr. Countryman was the acting undersecretary of state for arms control and international security. 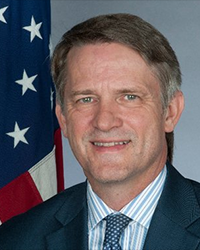 He served for 35 years as a member of the U.S. Foreign Service until January 2017, achieving the rank of minister-counselor, and was appointed in October 2016 to the position of acting undersecretary of state. He simultaneously served as assistant secretary of state for international security and nonproliferation, a position he had held since September 2011.